The Chinese lunar rover Yutu-2 and its lander Chang’e-4 have gone into hibernation as they enter their third lunar night on the far side of the Moon. According to Chinese news reports, both spacecraft have now exceeded their nominal lifespan. With all systems and payloads operating well, the Yutu-2 team will continue roving and science data collection on lunar day 4 of the Chang’e-4 mission, according to a [Chinese] announcement. Yutu-2 added 43 meters to its overall drive distance in its third day of activities, continuing a path to the northwest of the landing site, which was recently named ‘Statio Tianhe’ by the International Astronomical Union. The rover just covered seven meters between waking for lunar day 3 on Feb. 28 and Mar. 3, during which time it navigated carefully toward a 20 centimeter diameter rock in order to analyze the specimen with an infrared and visible light spectrometer to determine its origin. I am struck by how tentative the Chinese and their rover appear. The first Russian lunar rover, Luna 17, traveled 6.5 miles in eleven months. The second, Luna 21, traveled 23 miles in four months. At the pace Yutu-2 is setting, it will not come close to these mileages. Moreover, my impression of Chinese space technology in the past decade has been that it is quite robust. This tentativeness thus surprises me. Maybe because this is a government project they are simply covering their butts should something go wrong, and thus making believe the rover is more delicate than it really is. As Scotty on Star Trek once said, “Always under predict, then over perform.” We might be seeing that pattern here. Link here. Scientists have narrowed the choice to two sites. Now the rover science team is proposing landing between the two, so that both might be studied. There is a science meeting next week where the scientists plan to hash this out. Expect a final decision soon thereafter. NASA today announced that a test drone, dubbed Mars Helicopter, will be flown on the 2020 Mars rover mission. Cool image time! The Curiosity science team has released a panorama taken in October 2017 that looks north across the floor of Gale Crater and shows the rover’s entire journey since it landed in 2012. Rather than post the image here, I have posted below the fold a video produced by the science team that pans across the entire panorama, and then shows where Curiosity has traveled in that panorama. Look close, and you will realize how truly little of Mars we have so far explored. The recent failure by Curiosity to drill has caused engineers to stop the rover in its tracks while they analyze the cause of the problem. Two among the set of possible causes being assessed are that a brake on the drill feed mechanism did not disengage fully or that an electronic encoder for the mechanism’s motor did not function as expected. Lee said that workarounds may exist for both of those scenarios, but the first step is to identify why the motor did not operate properly last week. Though they do not say so, the problem is almost certainly related to a fundamental design flaw in the drill’s design that causes intermittent short-circuits when they use it, and has the possibility of shorting out the entire rover if they are not careful. On to Mars! The British have enlisted the skills of astronaut Tim Peake on ISS to do some test driving of a prototype rover planned for launch on the second ExoMars mission in 2018. I must be a bit of a skeptical grump here: Looking at this story I found it packed with more public relations junk than you can imagine. The whole test facility shown is absurd. All show, no reality. Also, their claims about the rover’s route-finding superiority don’t sound right to me. And the rover itself? This is the prototype of what they plan to launch in 2018? You have got to be kidding? We are less than two years from launch. While I grant this is probably only a model for testing the robot’s route-finding capability, using something held together by packing tape at this late date hardly fills me with confidence about the final product. Hat tip John Batchelor for sending me the link. The competition heats up: China today unveiled a one-third scale model of its planned Martian lander/rover, scheduled for launch in 2020. If they succeed in putting a lander and rover on Mars, China will have clearly demonstrated the capability to do almost anything in space that the United States can do. The competition in the coming decades should thus be most interesting. Posted from Tucson International Airport. Cool image time! The Curiosity science team has produced another panorama of Mount Sharp and the regions that the rover will soon traverse. This composite image looking toward the higher regions of Mount Sharp was taken on September 9, 2015, by NASA’s Curiosity rover. 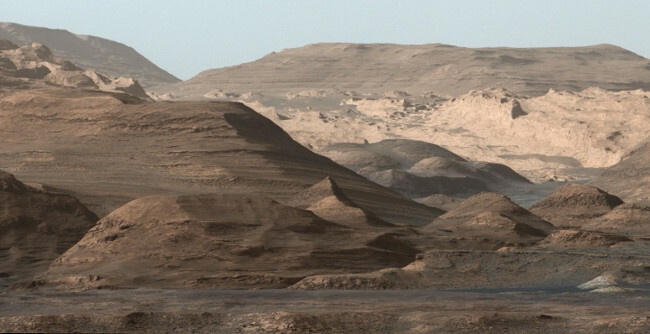 In the foreground — about 2 miles (3 kilometers) from the rover — is a long ridge teeming with hematite, an iron oxide. Just beyond is an undulating plain rich in clay minerals. And just beyond that are a multitude of rounded buttes, all high in sulfate minerals. The changing mineralogy in these layers of Mount Sharp suggests a changing environment in early Mars, though all involve exposure to water billions of years ago. The Curiosity team hopes to be able to explore these diverse areas in the months and years ahead. Further back in the image are striking, light-toned cliffs in rock that may have formed in drier times and now is heavily eroded by winds. They have adjusted the colors, adding blue, so that things look as they would on Earth, in order to help the geologists understand what they are looking at. Be sure and click on the link. The full resolution image is quite amazing. Like mountains on Earth, from a distance things look a lot simpler than they do once you get there. 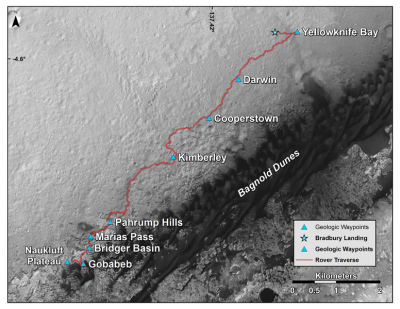 The slopes of Mount Sharp are complex and rugged, and will be a big challenge for Curiosity to traverse. 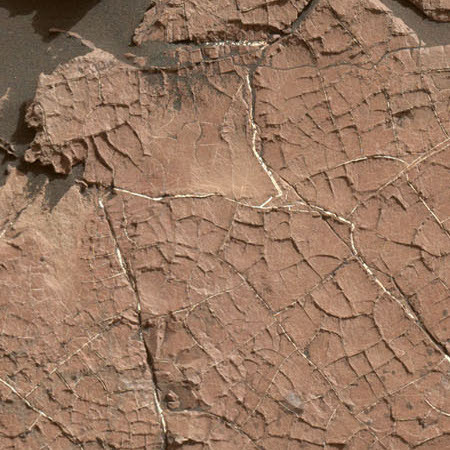 Moreover, this rough terrain illustrates that the Martian surface has, like Earth, been significantly shaped by erosion. The surface we see here is not the surface produced by the impact that produced the crater. It has been reshaped and eroded over many eons by many later processes, including wind and water. A three month old flash memory problem on the Mars rover Opportunity has finally been fixed by reformatting the rover’s memory banks. Since the problem came up in December they have been operating the rover without any flash memory, essentially running it on the equivalent of its ram memory. This fix allows them to once again store data on the rover and gives them more flexibility of operation. 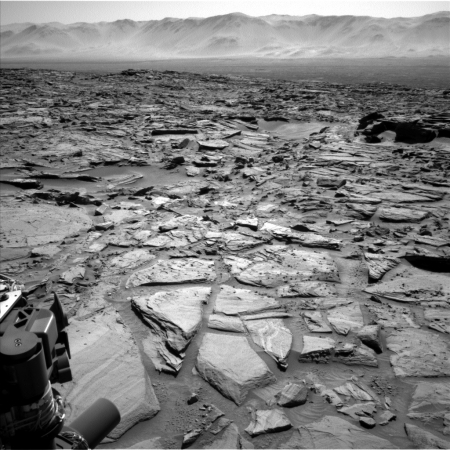 After six months and a short pause in work while engineers analyzed a short circuit, Curiosity has finally left the Pahrump Hills are on the slopes of Mount Sharp. 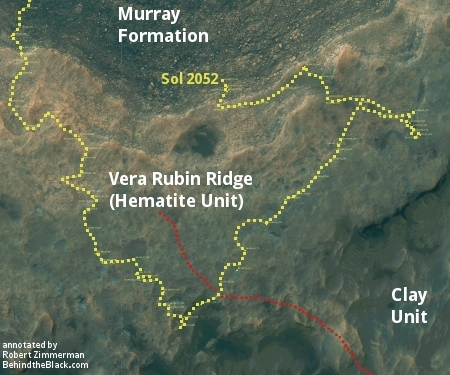 The link has a nice image showing Curiosity’s recent travels as well as its future route. China’s lunar rover Yutu, unable to move since its first few weeks on the moon, is slowly dying. The rover is currently in good condition and works normally, but its control problem persists, said Yu Dengyun, deputy chief designer of China’s lunar probe mission. “Yutu has gone through freezing lunar nights under abnormal status, and its functions are gradually degrading,” Yu told Xinhua at an exclusive interview. He said that the moon rover and the lander of the Chang’e-3 lunar mission have completed their tasks very well. The rover’s designed lifetime is just three months, but it has survived for over nine. As China’s first planetary rover mission, the limited roving success of Yutu is well balanced by its ability to continue functioning on the lunar survey for so long. The engineering data obtained from this mission will serve Chinese engineers well as they plan future missions.